A fully waterproof walking jacket, styled and fitted for ladies. The Double Ventile® jacket is durable and quiet, perfect for nature watching and photography in the worst of conditions. 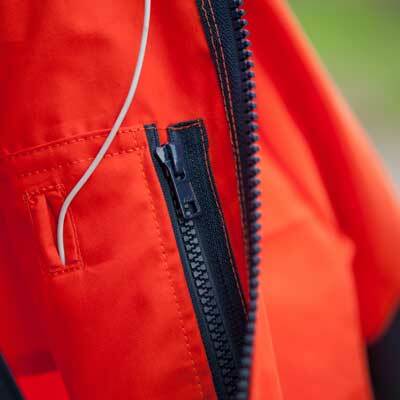 The hem and detachable hood are fully adjustable and the jacket features a host of zipped pockets for secure storage of everything that you need to keep handy. The jacket is particularly suited for all year walking and nature watching. As an alternative women's fit jacket with larger bellows pockets, consider the Rannoch DV Ladies Jacket. This jacket is named after Beinn Alligin in Torridon, in the North West of Scotland - an iconic mountain with fantastic views over wild moorlands and out to sea. Find out more in our Glossary>. With roomy sleeves for freedom of movement, a double-layered Ventile® jacket with multiple pockets, ideal for many outdoor pursuits. A double-layered Ventile® jacket with multiple pockets and temperature control features - perfect for winter activities. Fully waterproof. Lower bellow pockets. With roomy sleeves designed for freedom of movement, a double-layered Ventile® jacket with multiple pockets, ideal for many outdoor pursuits. A lightweight weatherproof single-layered Ventile® construction with double-layered waterproof shoulder & hood provides excellent breathability.